Most young local punk bands need a couple of years before you can take them seriously, with Rise-Up being the exception to the rule. The last time I have seen them live (probably about a year or so ago), their promising song writing suffered from a yet not too certain stage performance by some band members. 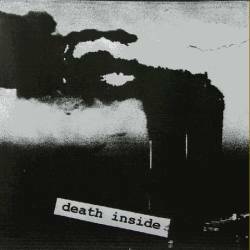 I guess they must have improved since then, because their debut CD Death Inside shows a matured band that does maybe not always sound original, but in everything they do, you can actually taste their heart blood. This album, co-released with the anarchist Pawee, is most probably one of the most political albums so far on Winged Skull, and Eric ranting about cops, government, cops, media, cops, society, cops,... (and did I forget cops?) can become irritating after some time, but can as well be excused on juvenile ambition. Fortunately the music never sounds juvenile. Fast yet melodic punk rock, with a strong vocalist who must have heard more than once Rancid or equally 70s inspired punk bands, with occasional excursions into two-tone territories without sounding commercial, some acoustic guitars, nice grooves, and a DIY sounding production that always knows how to evade a too polished feeling without ever sounding cheap and bad. At times, you might feel reminded of early Suicidal Tendencies (Revenge For Tha Dead), local punk legend Subway Arts (What About Suicide?) and of course most of the time just good working melodic punk rock. I prefer at a certain level the songs with personal lyrics (for instance Another Drinkin' Song), as the upbeat fun music never really conveys the anguish of the artist. If you generally don't care that much for lyrics (like probably most of us), you will get with Death Inside one of the coolest album by a young local band, that needs to be supported. 8 spiked points.